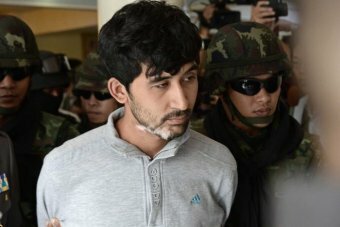 One of the two men arrested over last month's deadly Bangkok bombing has admitted to a charge of possessing explosives, police said. The suspect, Yusufu Mieraili, was arrested last week near the border with Cambodia. “We have informed him of the charge. He acknowledged and confessed to the charge,'' national police spokesman Prawut Thavornsiri told reporters. Police have not revealed his nationality, although he was caught in possession of a Chinese passport with a birthplace listed as Xinjiang – home to the country's oppressed Uighur Muslim minority. Police have said neither man is thought to have physically planted the bomb on August 17 at the Erawan shrine in downtown Bangkok that killed 20 people.